interEDGE: What led you to become a recruiter? Ruihan: What led you to become a campus recruiter? I’ve been in recruiting since my first internship, so I just went with the flow. I have had a lot of event planning experience so campus recruiting is a great combination. interEDGE: What are you looking for in a job or internship candidate, in addition to their technical skills? Ruihan: Whatever the job requires. Mainly soft skills in addition to technical skills, such as the ability to communicate with people (don’t worry, you don’t have to have an American accent), ability to perform as a team player (depending on the position), and potential of growing. Other than that, you should at least have the confidence. 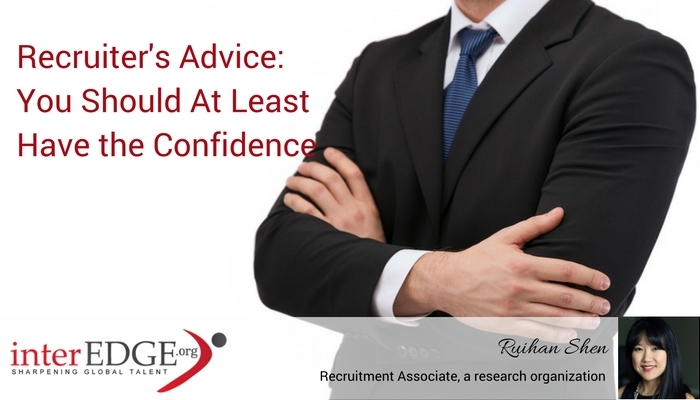 If you are not confident in yourself, how can the employer be confident in you? interEDGE: What is one career advice you would give to international students or college students? Ruihan: Do not think that you are different from American candidates. I’ve heard a lot of Chinese students asking what kind of positions would be good for Chinese students to apply. Then you are at a wrong position. Please please remember, you are NO DIFFERENT than others. Recruiters see you as a candidate, not as a person from another country. They don’t care if you are international or American; they don’t care if your first language is English or not. The only thing they care is whether you are qualified for the position, and work authorization is only one of the many possible qualifications depending on the company policy. So, please focus on building up your hard skills and soft skills for your dream job, rather than focus on finding some specific type of positions to apply. interEDGE: What are one or two mistakes international students often make in the resume or during the interview? Ruihan: One mistake a lot of people make is not tailoring your resume for the position. Recruiters have the kind of eyes that can search for the words they want and filter out the words that are not relevant to the position. The more irrelevant experience you have on your resume, the less strong you are for the position. During the interview,I’ve seen some candidates giggle a lot. Being nice is a great thing. However, between overly nice and professional, I would choose professional. Ruihan Shen was born in Hangzhou, China. She received a B.S. in Psychology from Beijing Normal University and a M.A. in Organizational Sciences from The George Washington University. She started her career in Human Recourses/Recruiting with Mercedes-Benz China. After she moved to the US, she interned at different places such as The Smithsonian Institution and Social Impact during school. Now she is a Recruitment Associate at a research organization in Washington, D.C. She is also an enthusiastic theater performer. The opinions expressed are the recruiter’s own and do not necessarily reflect the views of American Institutes for Research.